Michelle Williams tells children the story of how money hungry Disney executives wanted to make an Oz prequel. This was viewed at a 2D screening. Oz The Great and Powerful has some nerve by making itself a companion piece to one of the most beloved films in the history of cinema. Seriously – really? But that’s not what we’re here to talk about. Is this movie any good? The answer is a yes and no. Yes, the acting is efficient, with this movie casting the likes of James Franco, Michelle Williams, Mila Kunis, etc. Yes, the visuals are spectacular. No, it is not that engaging. No, it is not that fast paced, especially in the middle. Franco portrays Oz, a circus magician who is swept away from Kansas in a hot air balloon, landing in the land of Oz, where apparently he has fulfilled a longstanding prophecy. The first one to inform him of this is Theodora (Kunis), one of three witches that we are introduced to along the way. During their initial journey to the Emerald City, they come in contact with an evil witch, briefly. This and the fact that Kunis is wearing red during their meeting should be a sign of things to come. The first 10 or 15 minutes or so are in black-and-white, with a 1.33:1 aspect ratio, I guess as a nod to the start of the 1939 classic. When the land of Oz is introduced, the widescreen ratio and color are introduced. And boy, is it colorful. Well, that’s kind of expected. A lot of people are drawing comparisons between this and Alice in Wonderland (Burton, 2010). Why? Both are effects laden adaptations of beloved children’s stories. I didn’t think Alice in Wonderland was an especially great movie, and neither is this one. So there’s that. You would expect a fine showing in the acting department from the likes of our cast. And that’s what you get. They’re established talented performers. Here, a contrast can be drawn, between this and the other current blockbuster based off a children’s story, Jack the Giant Slayer. I haven’t seen that one, but I don’t have to in order to say this: Oz contains well known actors in the lead roles. Jack the Giant Slayer relies on a 23 year old English actor that most American audiences haven’t really thought of in years, with the big names heading up the supporting cast. Does this have something to do with Oz doing far better at the box office? Probably not, but it’s something to think about if you’re bored. Directed by Sam Raimi, Oz The Great and Powerful is a movie that will unquestionably appeal to little kids. There is endless joy in being swept away to a magical land filled with creatures like a small girl made of china, tiny “river fairies” and a climactic battle between good and evil in all ages, but I get the feeling that the younger viewers will get the most out of it, perhaps even if they haven’t seen the source material. 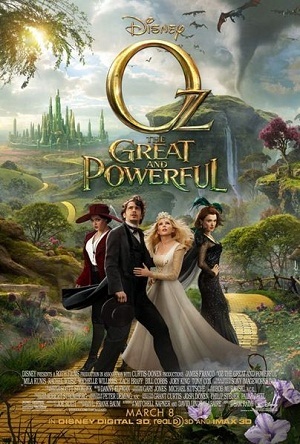 Oz The Great and Powerful is about as good as a movie could ever be when it tries to precede The Wizard of Oz. It isn’t that memorable, but there are moments of sheer brilliance, if you can get past the missteps and pacing problems.